Fraser wanted to commission an engagement ring for Rose that was a unique representation of her and their relationship. The gemstones within the design was carefully considered by Fraser- a garnet to symbolise Rose’s January birthstone and a ruby which is the birthstone for zodiac sign Capricorn. Fraser even found out the day of the week upon which Rose was born and discovered that ruby is also the birthstone for Tuesday!The handworked sterling silver band features 9 carat rose gold overlays and both metals have been shaped to create delicate curls which envelope the meaningful gemstones. 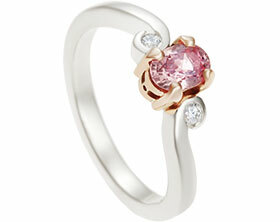 Intricate engraving alongside the ruby depicts a blooming rose, a symbol of the ring’s namesake. A polished finished completes this personal engagement ring.